Firing a revolver with oil, grease, or any other material even partially obstructing the bore may result in damage to the revolver and serious injury to the shooter and those nearby. l)o not spray or apply lubricants directly on ammunition. 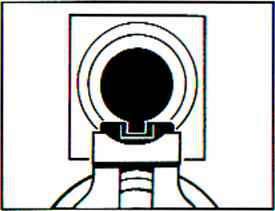 If the powder charge of a cartridge is affected by the lubricant, it may not be ignited, but the energy from the primer may be sufficient to push the bullet into the bore where it may become lodged. Firing a subsequent bullet onto the obstructed bore may damage the revolver and cause serious injury or death to the shooter and those nearby. Use lubricants properly. You are responsible for the proper care and maintenance of your firearms. Firearms made of stainless steel are relatively more resistant to corrosion than blued steel firearms. However, you should still inspect it frequently and clean, lubricate and apply an appropriate rust preventative as required. Sometimes surface discoloration may be noted, particularly in the grip area of stainless steel handguns, resulting from perspiration. Contact with some types of holsters can also cause stains or rusting. Rusting may also occur as a result of the handgun being exposed to moisture, humidity, salt air or chemicals. Minor discoloration can usually be removed by rubbing the stained area with an abrasive ink eraser, crocus cloth, or a "metal polishing" compound. When using any of these abrasives, proceed with care and use light pressure to achieve a blending of'color' with those areas that are not discolored. 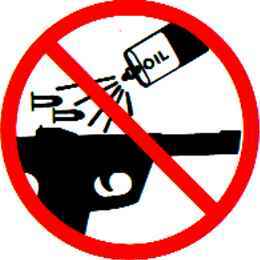 Exposed surfaces on the firearm should be cleaned and wiped dry after use or after exposure to adverse conditions. If the firearm is to be stored, coat it with a light film of oil or preservative. Where the firearm is in continuing use, and the presence of oil or grease would be objectionable, then the external surfaces can be coated (after cleaning and drying) with a paste wax formulated for use on metals. Apply the wax sparingly, allow time for it to dry hard, then buff lightly with a soft cloth. When applying the wax take care that it does not get into the mechanism or on the functioning parts such as the cylinder latch, trigger or cylinder locking notches. A properly applied hard wax coating will not interfere with comfortable gun handling and it will provide a measure of protection against the formation of rust. CARE OF "COLOR CASE FINISHED FRAMES"
The special finish process used to simulate the old-time "color case hardened" frames of antique revolvers is quite durable, but not as wear-resistant as a conventional blued steel finish. 1)0 NOT USE ABRASIVE CLEANERS ON ANY "COLOR CASE FINISHED" FRAMES. Note that the frames are "through hardened" just like other Ruger* revolvers. This finish is provided for those who prefer its mottled "old west" appearance. On the underside of each mounting ring assembly there is a locating *tab." By reference to this "tab," the mounting ring can be assembled to the scope so that the tab will fit correctly into the recess on the top of the barrel. Disassemble one ring and reassemble over the scope body between the turret and the eyepiece so that the clamp nut (D-73) is positioned to the left of the scope. Install the four top screws. Do not tighten. Disassemble the other ring and install it on the forward section of the scope tube with the clamp nut positioned to the left of the scope. Install the four top screws. Again, do not tighten. Assemble the rings to the barrel with the locating "tabs" engaging the recesses in the top surface of the barrel. Tighten the clamp nuts so that the rings are locked to the semi-circular cuts on the sides of the barrel. 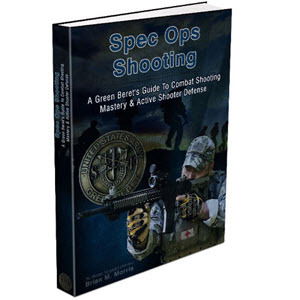 Rotate the scope until crosshairs are aligned properly, and slide scope to desired eye relief. Then tighten the eight top screws a bit at a time to grip the scope body. Sight in according to the direction with your scope. 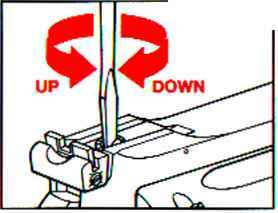 To point of impact: turn screw counterclockwise. Ruger* Vaquero & BisleyVaquero Revolvers feature a blade front sight and a fixed rear sight They are factory set to be on target at 25 yards and cannot be further adjusted. The HUNTER model revolver is provided with an insert front sight. 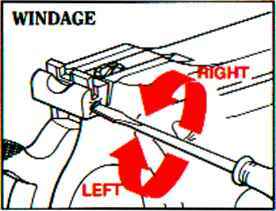 To change the front sight, depress the spring loaded plunger in the front of the barrel rib with a small punch and lift rear of sight blade. WARNING: BEFORE SHIPPING ANY FIREARM, BE ABSOLUTELY CERTAIN THAT IT AND ITS CYLINDER OR MAGAZINE ARE UNLOADED- DO NOT SHIP CARTRIDGES WITH A FIREARM. The Federal Gun Control Act. as well as the laws of most States and localities, do not prohibit an individual (who is not otherwise ban-ed from purchasing or possessing a firearm) from shipping a firearm directly to the manufacturer for repair. However, before shipping your firearm to us. be certain that your State or locality docs not have a law or regulation which will prohibit you from receiving it from us after it has been repaired. If such receiving is prohibited, then please have a Federally Licensed Firearms dealer ship the gun to us. If your gun is sent to us by a dealer, it will be returned to him after being repaired. If a handgun (pistol or revolver) is shipped by an individual who does not hold a Federal Firearms License, it must be shipped via I'.P.S. Persons who do not hold a Federal Firearms License are prohibited by Federal law from shipping a handgun by mail. Handguns mailed in violation of the law are impounded by the Post Office. Enclose a letter which includes your name, address, telephone number, serial number and model of the firearm. Describe in detail the trouble you have experienced with your firearm, or the work you wish to haw done. Merely stating that the firearm "needs repair" is inadequate information. Work performed will bear a net minimum labor charge of S15.00 plus a $5.00 shipping and handling charge. The charge for rebluing the RI GVR* \KH notn.l. SI\GiJt: ACT MOM revolvers is S35.00 plus a $5.00 shipping and handling charge. \V<- ^nnot apply the "color case finish" of the Rn^r \'M\wrn to anv other single action revolver. Custom gunsmithing service or nonstandard alterations are NOT AVAILABLE from Ruger Service Departments. How to properly lube a ruger super blackhawk? What oil to put on stainless ruger super blackhawk? What is the best ruger blackhawk or the bisley blackhawk?